Stretching from north to south and surrounded by the sea, Japan's culinary culture has developed based on the four seasons and is centered on savoring the seasonal blessings of the foods of the fields, mountains, and sea. From ancient times, the Japanese have valued seasonality as an important part of daily life and have referred to various calendars as a way to enrich their lives. 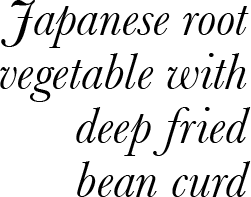 Calendars, such as nijushisekki (24 solar terms) which indicate different stages of the seasons such as risshun (start of spring), geshi (summer solstice), and shunbun (autumnal equinox), and shichijuniko (72 pentads) that express more subtle seasonal shifts is deeply related to the Japanese food culture, used as a guide to follow the seasons and to practice agriculture. 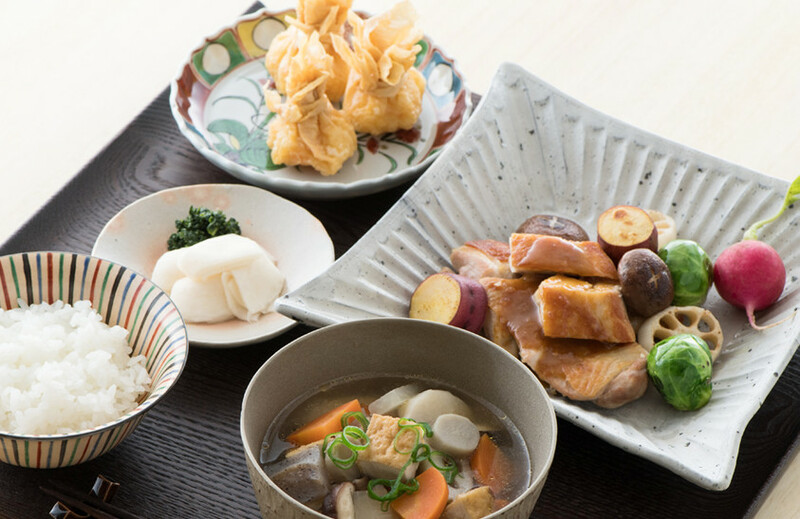 In "Teishoku of the Seasons," we'll be sharing the appeal of enjoying seasonality through the seasonal foods used in teishoku, an everyday meal for the Japanese, as well as introducing the relationship between the ancient calendars (handed down to present day) and the food culture. Winter has arrived, enveloping us in biting cold air. We have prepared a range of delicate ingredients, bolstered with plenty of nutrition to get you through the harsh winter, a season characterized by cold penetrating wind. A table loaded with fare incorporating a variety of tasty ingredients is sure to warm the body and soul from the very core of family returning home through the cold this winter. Once you have prepared a tasty meal, why not be selective in the tableware you choose to showcase it and enjoy the difference that brings to the table? 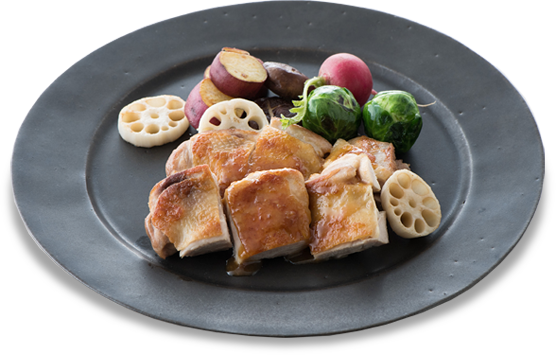 This is a meal centered on the main dish of chicken with a miso sauce that offers a light way to enjoy the chicken topped with a miso sauce that serves as the perfect accompaniment to steamed rice. To accompany the main dish, we have prepared a range of colorful winter vegetables. 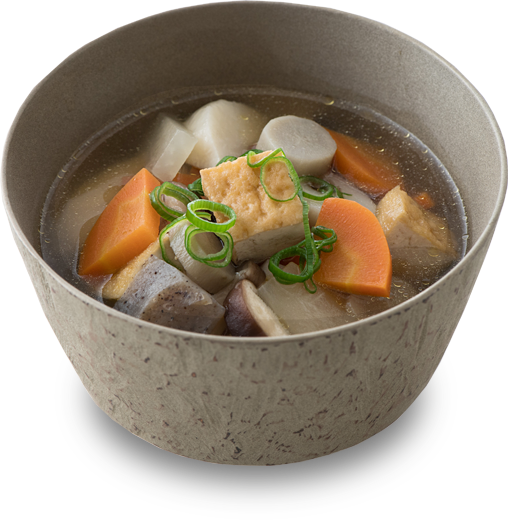 The Japanese root vegetable and soup is packed full of seasonal vegetables to provide enough volume to also serve as a side dish. This dish is the perfect accompaniment to steamed rice with tender, aromatic roasted chicken thighs served with a refreshing, red miso paste sauce. This is accompanied by charming round slices of sweet potato and lotus root. It is served with nutritious Brussels sprouts and red radish to provide a dash of color. ❶Remove the string of the chicken thighs, wipe with the rice wine and season with salt. Add oil to a preheated fry pan and add the chicken skin side down. Cover the chicken with aluminum foil and place a pot or fry pan with a flat bottom on top of the foiled chicken. Roast over medium to low heat for approximately 7 minutes, until thoroughly cooked. Remove the foil and pot, turn over the chicken and roast until golden brown. 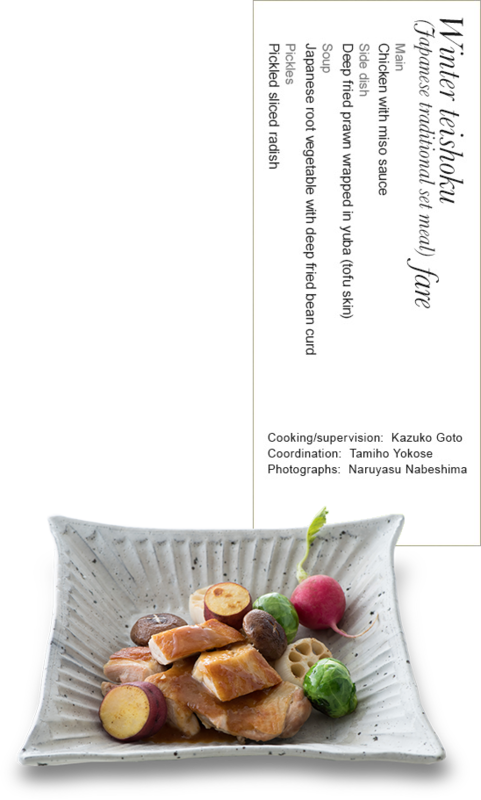 ❷Cut vegetables into desired size and roast all except the radish in a frypan. ❸Place the red miso paste in a bowl and stir well. Add and mix the sugar, mirin and mayonnaise, and then finally add the chili oil. 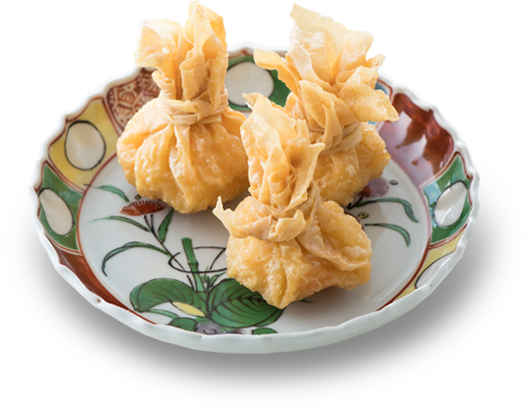 Yuba is commonly found on the dinner table in Kyoto. Roughly chopped prawns are kneaded, mixed with flour to give a velvety feel, dipped in egg for added volume. It is then wrapped in yuba and deep fried. Tying the yuba parcels with thinly cut strips of yuba before frying them will ensure they don’t fall apart when you eat them. This soup, packed full of root vegetables that are at their best in winter, gets its delicious flavor from the vegetable-derived stock. 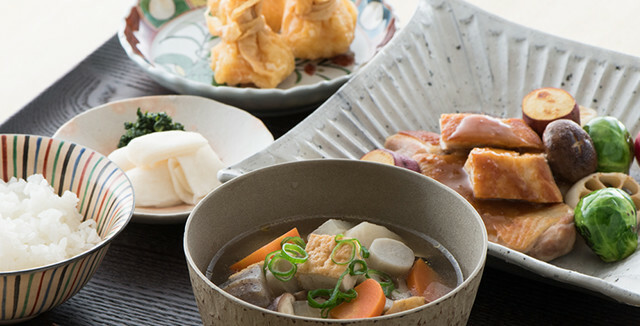 It contains a colorful arrangement of seven vegetables, including daikon (Chinese radish), carrot, taro, konjak, burdock, deep fried bean curd and shitake mushrooms. The role of tableware is to showcase the star of the table, the meal. By carefully selecting tableware to show off your meal, you can enjoy the flavor not only with your palate, but also your visual senses. A different feel can be achieved for the same dish, simply by changing the tableware you choose to serve it in. Try a combination of different tableware to discover something new in the way they complement each other. 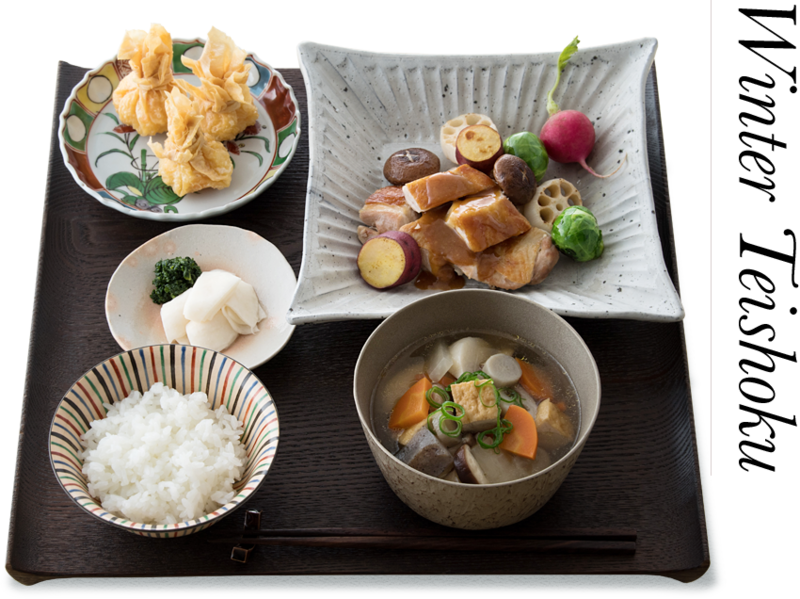 The square dish chosen for the main is a Japanese dish that expresses the simplicity achieved through handcrafted pottery. The chicken has been sliced diagonally and plated to give it height and a three dimensional feel for increased enjoyment. 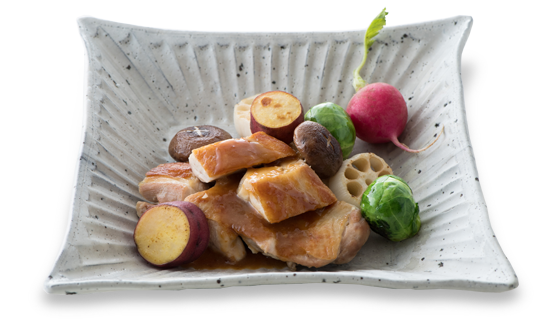 This is a modern Japanese dish that expresses a sense of simplicity found in hand-formed pottery. It has the advantage of being easy to use and can effectively showcase any meal. Colored dish that gives the table a sense of flamboyance. The top pictures dianthus blossoms (autumn), the bottom peach (spring) blossoms and can be brought out to color a table all year round. The pickles are plated on a dish of Kyo-yaki (pottery from the Kyoto area) picturing a single flower in the center. It is finished with a pale pink glaze heralding the long-awaited spring. The rice bowl is also a dish of Kyo-yaki with a vertical striped pattern. It gives a sense of warmth, and the white rice looks delicious. This is a unique dish with a luster that looks like it is made of metal at a glance. In fact, it is fashioned from wood and coated in tin. The main dish is put on a distinctive, large black plate. The chicken has been cut into squares and presented flat to match the plate. Black meat plate with a modern twist. 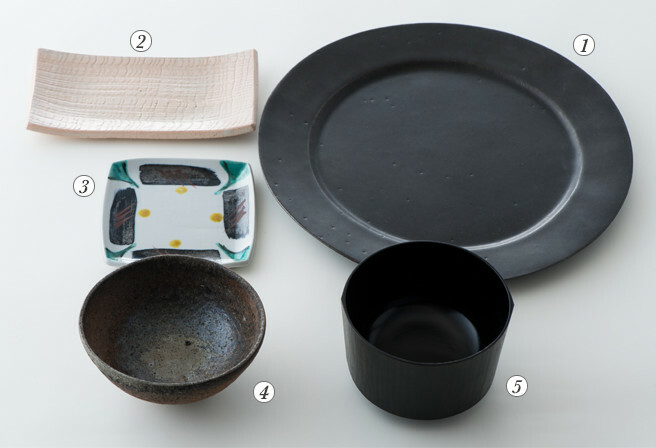 While perhaps best described as western-style tableware, the matte finish suitably complements Japanese cuisine. The side dish has been served on a dish of kyo-yaki. While you have to be careful serving meals on tableware that stands out too much, this dish is elegant and the nonassertive colors make it ideal to showcase any meal. 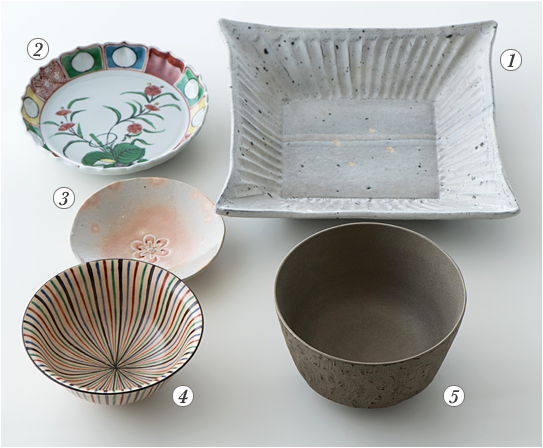 The design depicted in colors characteristic of Kutani-yaki provides a contrast to the other tableware. This is a common unglazed porcelain dish. The size and weight of the bowl fits comfortably in the hand and is characterized by the earthy feel you get when holding it. The soup bowl is a black lacquered bowl shaped with distinctive edges. 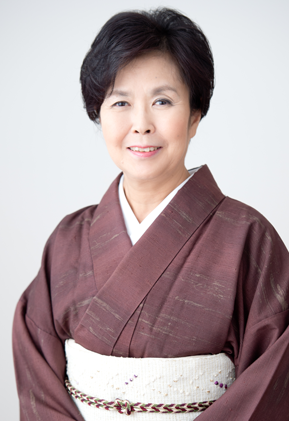 Born as the eldest daughter of the grand master of Mushanokoji-senke, one of the three main schools of Japanese tea ceremony. Goto studied ceramics as an art history major at Doshisha University. 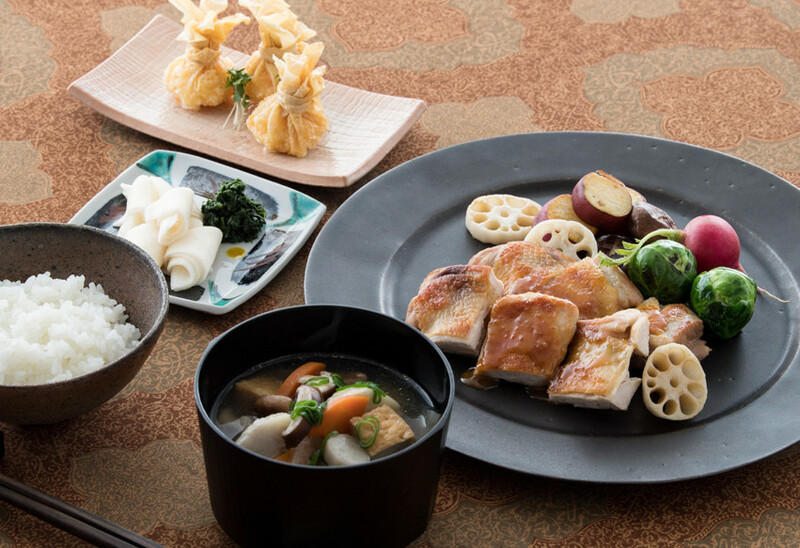 Her dishes, based on kaiseki-ryori which she received training from her mother, a leading pioneer of chakaiseki-ryori (a traditional meal served to guests before a tea ceremony), incorporates different ingredients and cooking styles she encountered from her frequent visits abroad. Her dishes, arranged for the contemporary household, embody the culinary culture and soul of Japan. —Vice President to Washoku Japan.